The Saskatoon Blades got the opening goal of the game on Friday night, sending toques raining down. 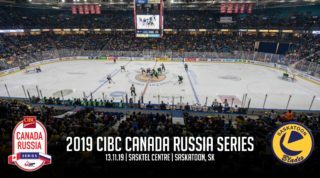 But, it was the Regina Pats who got the last laugh, defeating the Blades 5-3 as Saskatoon kicked off a three game in three night weekend against their rivals from the south. The Saskatoon Blades opened up Global TV Toque Toss Night with a great chance just past the first minute mark. The chance came as Ryan Graham broke in all alone on Dawson MacAuley. Graham didn’t get a chance off, with Chase Clayton getting denied on the rebound to keep it scoreless. Saskatoon then didn’t miss on their next chance. The play came as Graeme Craig chipped the puck to Nikita Scherbak, and the import broke in down the right wing around his defender and slid it home for his 19th of the season to make it 1-0 early. Fans got out of their seats and made it rain with winter wear. The winter gear was collected and will be donated to groups in Saskatoon who need it most this winter season. 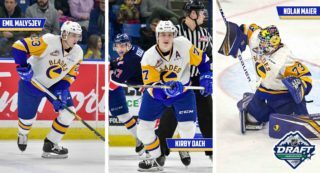 The Blades nearly doubled that lead two minutes later when a 2 on 1 rush between Scherbak and Collin Valcourt, with the Russian import just bouncing his chance wide of the Pats goal. The Pats then had their chance to get on the scoreboard. Seconds after a point shot was stopped by the mask of Alex Moodie, the puck was cycled back with Dryden Hunt walking through the slot and wristing a shot high past the glove of Moodie to make it 1-1 at 7:26 of the frame. The Pats would then strike again at 15:55 while on the powerplay. Braden Christoffer jammed home a loose puck on the man advantage after a Dimitry Simitsyn point shot left a puck on the doorstep, making it 2-1 Pats. A Chase Clayton wraparound that went wide was the Blades best chance in the rest of the period as it was 2-1 Regina through 20 minutes. The shots were 14-10 for Regina after the first period. The Pats almost extended the lead early in the period when Carter Hansen broke in all alone on Alex Moodie, but was stopped when the Blades goalie got his right arm up to make the save. After that, Saskatoon got back even with the Pats. The goal came at 5:16 after a Nolan Reid point shot left a rebound in front for Valcourt, who chipped it home to make it 2-2. The assist for Reid came in his first WHL game, as the Deer Valley, SK product was playing in his first career WHL game as the Blades top pick in the 2013 WHL Bantam Draft. But, the tie game didn’t last long. Only 26 seconds later Connor Gay walked down the middle of the ice and around Moodie, beating the Blades goalie for his 6th of the year to make it 3-2. 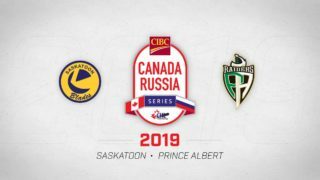 The Pats then extended the lead at 10:52 on the PP when Saskatoon product Boston Leier finished off the play from in close, beating Alex Moodie. The Blades came close to end the period with chances from Cameron Hebig, Austin Adamson and Ryan Graham all getting denied on point blank chances as the Blades led 24-21 on the shot clock through 40 minutes despite being down 4-2. The Blades got off to a great start in the third period as only 27 seconds in they cut the lead to 4-3. The tally came from Scherbak, who got his second of the night and 20th of the season, when Nathan Burns picked off a high pass in the Pats zone, dropped it to the ice and fed Scherbak for the quick one-timer than beat MacAuley. The Blades came close to tying the game minutes later with a man advantage when a point shot left a puck beside the Pats goal, with Brett Stovin coming close to jamming home the puck. The Pats then had their own chance to extend the lead with 10:05 remaining as Chandler Stephenson pounced on a rebound in front, but Moodie was able to get a pad down to make the stop from in tight. 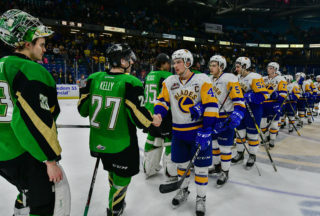 Saskatoon continued to create their chances down the stretch, pulling the goalie and getting a good look from Nathan Burns from the slot late, but Dawson MacAuley had the last laugh. He ended up making 33 saves as an empty net couldn’t help Saskatoon as they fell 5-3 to Regina, with the Pats hitting an empty netter late. The Blades were 0 for 4 on the PP and 2 for 4 on the PK as they outshot Regina 36-33 in a losing cause. Nikita Scherbak’s 2-goal performance left him with first star honours, while Boston Leier and Dryden Hunt were second and third stars. The Blades next home game goes tomorrow night against the Kamloops Blazers. 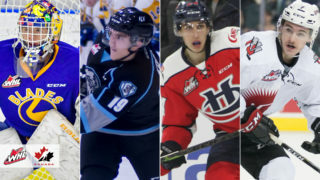 The game marks only the second last game for the Blades before the WHL’s Christmas break. You can go ahead and find your tickets for tomorrow’s game against the Blazers by clicking here.